The dissolution of the Soviet bloc after 1989 was hastened in the Baltic republics by mass popular resistance waged through non-violent cultural and political means. In Lithuania, the revolutionary efforts that began in the spring 1988 culminated in a formal declaration of independence in March 1990. After demands to submit to Soviet authority were ignored, the Soviets sent troops to occupy key buildings in Vilnius killing fourteen protesters in the process. In the face of a resilient resistance and international pressure, the Soviets held on to power for several months, until turmoil at home forced them to recognize Lithuanian independence on September 6, 1991. This small collection contains a selection of publications dating roughly from the time of the Lithuanian revolution of 1988-1991. Along with a series of mostly pro-independence newspapers and magazines, the collection includes some interesting ephemera, including a series of scarce appeals for independence issued by Sajudis and their Latvian and Estonian partners, a pair of buttons, posters, fliers, and pamphlets. Although most of the materials are in Lithuanian, the collection includes a few written in Russian or English, and there are a few items relating to Lithuania reflecting a Soviet provenance. The dissolution of the Soviet bloc after 1989 was hastened in the Baltic republics by mass popular resistance waged through non-violent cultural and political means. 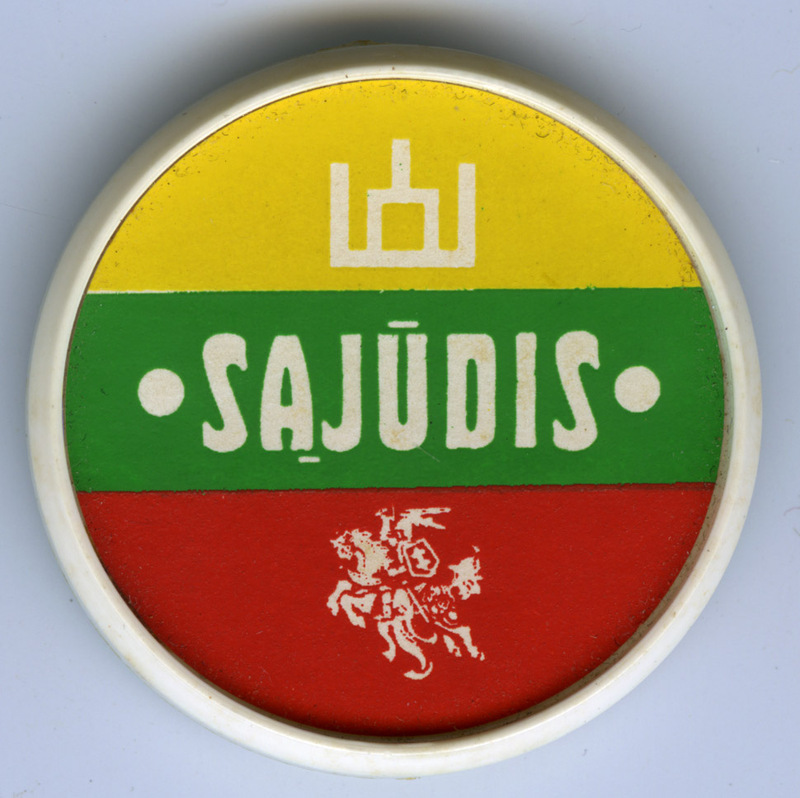 With Russian Perestroika and Glasnost encouraging independence movements throughout the eastern bloc, the Lithuanian movement kicked off in earnest during the spring 1988 with the formation of Sajudis, a political party, and the more radical Lithuanian Freedom League. Together, these organizations pressed forward with a concerted campaign of non-violent mass protests which continued throughout the country for well over a year. After receiving a large majority of seats in the government during the 1990 elections, Sajudis spurred the Lithuanian Supreme Council to a formal declaration of independence on March 11. A swift and predictably harsh response ensued, as the Soviets turned up the pressure on their subject state by increasing troop levels at the border, pressuring political opponents, and blockading oil and gas shipments into the country, causing severe economic distress. Although the Lithuanian parliament agreed to suspend their declaration, pending negotiation, mass resistance resumed the following winter. Under the guise of the National Salvation Committee, Soviet supporters issued a plea for Soviet military intervention, setting off the most dramatic events of the revolution. Between January 11 and 13, 1991, fourteen civilians were killed and over 700 wounded as Soviet forces seized control of the television and radio broadcasting center and other buildings in Vilnius. The grim events, however, were not the end. Responding to the provocation, pro-independence activists surrounded occupied buildings with large groups of singing men and women and they carried out hunger strikes and other non-violent acts of symbolic resistance around the country. After a failed coup against Mikhail Gorbachev in August, Soviet dominance collapsed. Lithuanian independence was formally recognized by the Soviet Union on September 6, 1991. Baltic Assembly Draft Documents [including Declaration of the rights of the Baltic Nations]. Talinn : s.n. Gift of James and Sibylle Fraser, Dec. 1976. Processed by I. Eliot Wentworth, Feb. 2018. Cite as: Lithuanian Revolution Collection (MS 1025). Special Collections and University Archives, University of Massachusetts Amherst Libraries.